The priestess Kikyo, nothing else. This is really aesome. I pretty much dislike Kikyo but I love this pic. I like how you shade. Awesome how it looks like the orbs seem to make her glow. Hahhahaha! 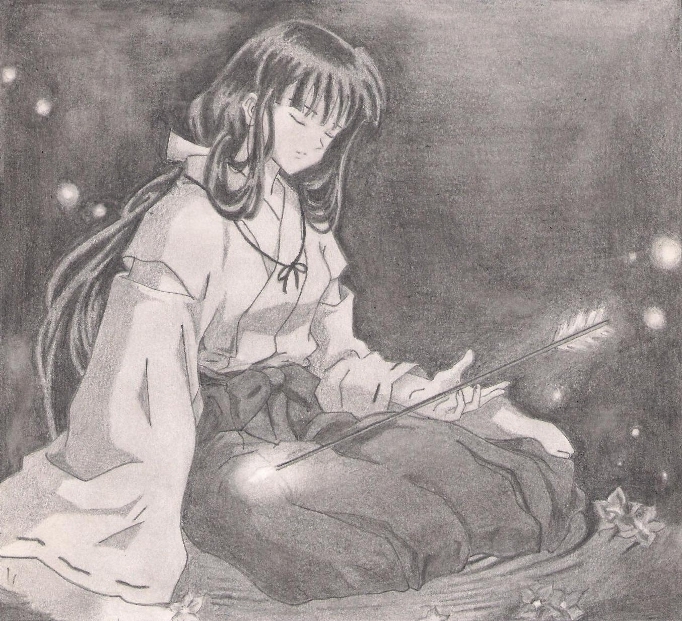 I'm happy you like the picture dispite you dislike Kikyo. can I ask why don't you like her? makes we want to get back in to drawing... i just dont really got the time. "this is in no particular order"
I know what you mean, I've struggling myself to finish a couple of pictures, but university consumes almost all my time. Actually this picture is quite old, I made it a few years ago, I haven't drawn any anime in a long while. I also miss Inuyasha, I was sad when Inuyasha Kanketsu Hen finished earlier this year, it was the last anime I watched. My favorites include Inuyasha, dbz and saint seiya. But... could you please tell me what that is? Nice wrinkled clothes. Those are hard to draw. Though I think you over did it on the bottom part, but it still looks awesome. Thanks, I'm happy you liked it. Thanks for your comment and for the favorite.